One Tam and Mill Valley Recreation are partnering on a first of its kind celebration of Mt. Tam on October 3 & 4, 2015. The weekend includes walks, talks, art, music, and a family-friendly festival that includes over 30 of the organizations that help protect and care for the mountain. Learn more at onetam.org/celebrate-tam. Come out for a variety of history and nature walks, volunteer activities, and fitness across the mountain during the day on Saturday, October 3rd. All activities are free, but space is limited and registration is required. Get more details about these events and sign up here. The Mill Valley Community Center is thrilled to host this evening of art, poetry, and appreciation of Mill Valley’s natural beauty and artistic community. 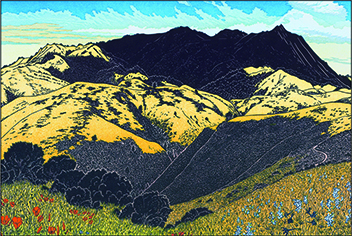 This event kicks off this month-long exhibit of Tom Killion's artwork, featuring prints from Tamalpais Walking. The evening will also feature a poetry performance, Q&A, and book signing by prize-winning international poet Jane Hirshfield. On Sunday, come for a day of family-friendly fun and activities at the Mill Valley Community Center! Our Kid Zone is the perfect place for your toddler through middle schooler to test their jumbo Jenga skills at the Tower of Tam, work off some extra energy, and get creative with arts and crafts. You’ll also enjoy food, live music by Jill and Steven Pierce (2/3 of the band Orange Sherbet), and the chance to interact in fun ways with the amazing organizations working to care for Mt. Tam. Join the leadership of the five Tamalpais Lands Collaborative (TLC) partner organizations at the Mill Valley Community Center for an interactive and engaging dialogue about the TLC and its One Tam initiative, what the collaborative has undertaken in its first year, and plans for the year ahead. This event is open to the public, and registration is not required. Download the agenda here. 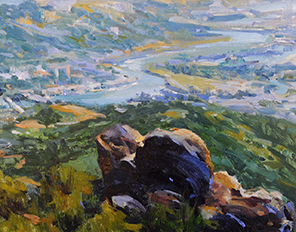 Join renowned artists for an open air painting retreat, art sale, and reception to support One Tam, and the long-term care of our beloved Mount Tamalpais. Preview Show, Reception & Sale at Ralston White Retreat, Purchase tickets here. Claire Hathaway comes to us from Radford University in Radford, Virginia, where she earned a bachelor’s degree in political science with a minor in history. Claire will be working with groups of students and adults participating in conservation programs, and will be helping with public outreach engagement. Tatiana Manzanillo recently graduated from San Francisco State University with dual concentrations in environmental studies and geography. A San Francisco Bay Area native, Tatiana is excited to join the One Tam team to help develop and run habitat restoration, trail maintenance, and community science programs. 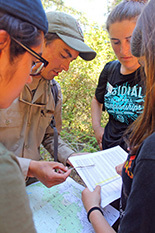 The Linking Individuals to Natural Communities (LINC) program immerses high school students in environmental stewardship, service projects, and career and leadership training for six weeks in the summer. Brought to Mt. Tam for the first time this year, the Mt. Tam LINC program gave 17 students a week with each TLC partner agency, during which they gained a wide range of professional and technical skills. They also got to spend time with the Friends of Mt. Tam, learning the history of the mountain and its conservation. Learn more about these amazing students and their experiences on Mt. Tam here. 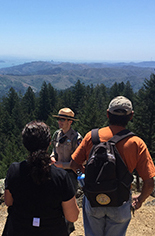 This summer, Mount Tamalpais State Park partnered with Friends of Mt. Tam and Latino Outdoors to provide an interpretive hike conducted entirely in Spanish. Seventeen residents of the Canal Area in San Rafael joined the hike, where they visited the Mountain Theater, enjoyed spectacular views from the Old Mine Trail, and learned about the mountain’s plants and animals. Friends of Mt. Tam provided funding for a shuttle from the Canal Area, as well as a barbecue lunch, and staff from the Tamalpais Lands Collaborative and the Bay Area Ridge Trail Council also pitched in. This program is a part of the nationwide Healthy Parks, Healthy People and Parks Forward initiatives, which strive to provide underserved communities with more opportunities to access public parks in order to provide a space for healthy active lifestyles. Please consider adding your name to the growing community of One Tam supporters at onetam.org/lend-your-name. There is no financial obligation; just providing your name will show your support of our mission to work together to care for the mountain we all love! You can support the One Tam community campaign — and give the mountain a little TLC of your own — with your purchase of Mt. Tam gear and art. Become a founding supporter of the "Next 100 Years' Tam Team" by contributing $100—and be among the first to receive the official One Tam trail map, magnetic bumper sticker, and the classic Michael Schwab poster of Mount Tamalpais.